Bill which prevents companies from participating in government bids if they boycott Judea and Samaria communities passes second and third readings. The Knesset approved on Monday the second and third readings of the ‘Boycott Bill’ which prevents companies from participating in government bids if they take part in a boycott of a business in Israel. The bill, which passed by a majority of 47 to 38, stipulates that anyone calling for an economic, cultural or academic boycott against the Jewish communities in Judea and Samaria will be unable to participate in government tenders. In addition, any person who considers himself a victim of a boycott could sue the boycotter for compensation. 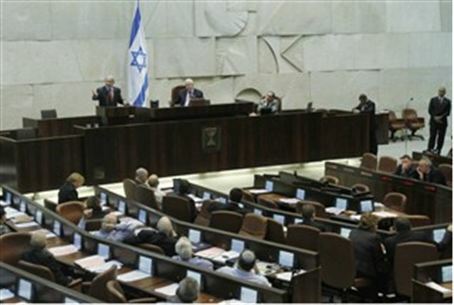 Several Knesset members did not attend Monday’s vote, including Prime Minister Binyamin Netanyahu, Foreign Minister Avigdor Lieberman, and Defense Minister Ehud Barak. Coalition chairman and Likud faction chairman MK Ze’ev Elkin, who sponsored the bill, welcomed its approval. Elkin expressed disappointment in the members of Kadima, who denounced the bill and voted against it after originally being among its initiators. “Kadima’s zigzag, when [opposition leader Tzipi] Livni made the party members remove their names from the law despite them being among the initiators, proves that it is a party without an ideology and that is has acceded to leftist organizations, thus finally placing Kadima on the left side of the map,” Elkin said. After the law was passed, Yesha Council Chairman Danny Dayan asked Finance Minister Yuval Steinitz to issue regulations which would prevent Israeli companies who participate in the Arab boycott of Israel to take part in government tenders. Meanwhile, Balad faction chairman MK Jamal Zahalka denounced the law, calling for a mass violation of it and saying it was a clearly unconstitutional law. “The Knesset has become the home base of the enemies of democracy and every week it produces a new racist or anti-democratic law,” Zahalka said. The boycott law was initiated after it became known that several Israeli firms had agreed to boycott Jews in Judea and Samaria in order to win contracts for the new Palestinian Authority city of Rawabi, near Ramallah. After the boycott law was passed, MK Michael Ben-Ari (National Union) said he was preparing the first lawsuit under its provisions, against Israeli company Teldor which is one of those companies involved in laying infrastructure in Rawabi, and as such has signed a document certifying that it does not do business in Judea and Samaria. Ben-Ari said that he would file a complaint against Teldor unless it immediately declared that it was not participating in a boycott of Judea and Samaria. “The rule of law must be upheld,” he emphasized.